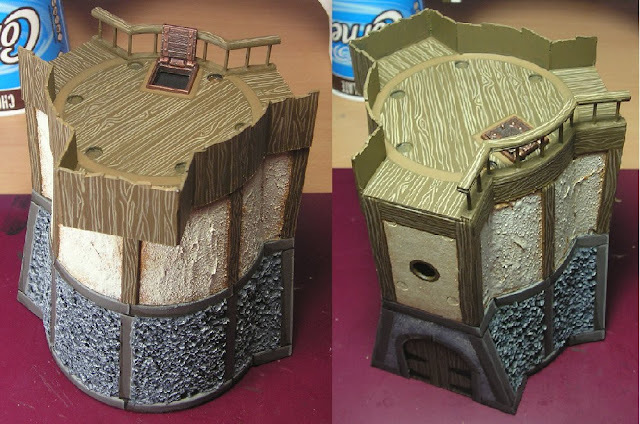 I (mostly) finished painting up the prototype Benan Watchtower. Sorry about the change in tones between the pictures the real colour is somewhere between the two. Watchtower without the canopy roof. The optional die-cast hatch opens and closes and is not yet painted. The recessed magnets to connect the canopy roof can clearly be seen in the deck. In the right hand picture you can see the door modeled into one of the flat wall connecting sections - this is hidden by an attached wall, but can be used as an entrance to the tower if it is used stand alone. 4mm magnets are glued into the base of the tubes that form the pillars for the roof and the whole roof section snaps into place. There is too much of the wood colour and pattern here so I will probably change the pillar colour slightly before I finish the grain on it. Overall I like the design but there are a couple of changes I want to make. Don't recess the magnets so far. So when the roof is not installed the magnets are flush with the surface. Change the roof on the canopy. Although the planking works I think it is too similar to the rest of the wood. I think I shall offer a shingle kit to go on top of it. 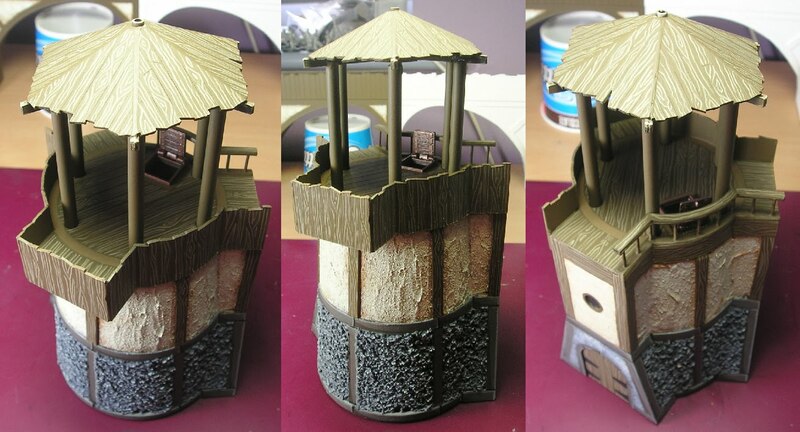 (note that a conical roof from the pryn-gul tower or the stables kit will also fit. As always comments and suggestions are very welcome.